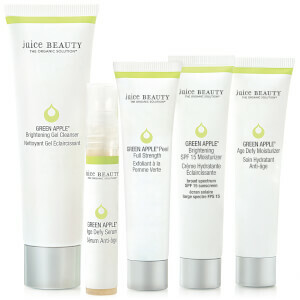 Achieve clear, healthy-looking skin with the Blemish Clearing™ Solutions Kit from Juice Beauty. Ideal for oily and combination skin types, the set combines four organic treatments to transform your daily skincare regime, resulting in a refreshed and balanced complexion with minimised acne breakouts. Free from parabens, petroleum, sulfates and synthetic fragrances. Cruelty free. Formulated with nourishing Coconut Oils, the lightweight facial cleanser works to deeply clean skin, eliminating dirt, impurities and excess oil with a purifying blend of Organic Sage, Lemon Balm and Dandelion extracts. It leaves skin clarified and rebalanced without stripping away essential moisture. Unclog pores and reduce breakouts with this powerful serum. Enriched with Willow Bark and Salicyic Acid, it refines and purifies skin while evening out discoloration with Organic Lemon and Apple Acid extracts. 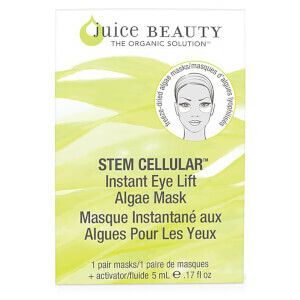 Fortified with antioxidant-rich vitamins and complexes, it fights free radical damage to leave skin softened and hydrated. This patented peel has been expertly formulated to exfoliate and clear skin, helping prevent further blemishes and breakouts. Containing a potent blend of Organic Aloe Vera extract, antioxidants and vitamins, the face peel harnesses the powers of AHA to gently exfoliate skin, lifting away dirt and unclogging pores for a refined and revitalised complexion. Lightweight and oil-free, the moisturizer helps restore skin’s natural hydration levels with a certified organic blend of Grape, Pomegranate and Aloe Vera. Brimming with vitamins, antioxidants and nutrient-rich Sea Algae, the face cream promotes healthier-looking skin and replenishes essential fatty acids, resulting in brighter and softened skin. Cleanser: Cleanse morning and evening by massaging onto damp skin in a circular motion. Rinse well. Serum: After cleansing with Juice Beauty’s Blemish Clearing Cleanser, apply this treatment serum to entire face or just to blemished areas. Use morning and night. Peel: After cleansing in the evening with your favorite Juice Beauty Cleanser, apply a generous layer to entire face, avoiding the eye area. Leave on for 10 minutes. (Flushing and tingling are normal.) Rinse well. Moisturizer: First cleanse with the Juice Beauty Blemish Clearing Cleanser, then apply Blemish Clearing Serum and finish by applying this moisturizer to your face and neck every morning and night. Serum: Active Ingredient: Salicylic Acid 0.75%. Inactive Ingredients: Organic Juices Of Vitis Vinifera (Organic White Grape Juice)*, Pyrus Malus (Organic Apple Juice)*, Aloe Barbadensis (Organic Aloe Juice)*, Citrus Medica Limonum (Organic Lemon Juice)*, Vegetable Glycerin, Sclerotium Gum, Algin, Salix Alba (Willow Bark Extract), Allantoin, Decyl Glucoside, Panthenol (Vitamin B5), Magnesium Ascorbyl Phosphate (Vitamin C), Tocopherol (Vitamin E), Salvia Officinalis (Sage Leaf Oil), Ubiquinone (Coq10), Saccharum Officinarum (Sugar Cane Juice), Organic Botanical Extracts Of Camellia Sinensis (Organic White Tea Leaf Extract)*, Camellia Oleifera (Organic Green Tea Extract)*, Lavandula Angustifolia (Organic Lavender Extract)*, Chamomilla Recutita (Organic Chamomile Extract)*, Melissa Officinalis (Lemon Balm Leaf Extract), Algae Extract, Sodium Benzoate, Potassium Sorbate, Citric Acid, Lavandula Angustifolia (Lavender) And Boswellia Serrata (Frankincense) Pure Essential Oils *Certified Organic Ingredient.